Be the first to share your favorite memory, photo or story of Wanda . This memorial page is dedicated for family, friends and future generations to celebrate the life of their loved one. 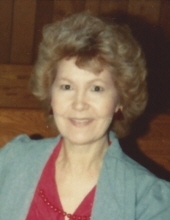 Wanda Irene Weaver, 83, of Elizabethtown passed away Thursday, April 4, 2019, at Hardinsburg Nursing and Rehabilitation. She was the owner/operator of Shear Glamour, where she was a beautician. She was a Baptist by faith. She was preceded in death by two grandchildren, Kimberly Kay Campbell and John Edward Lazarus; her parents, Elhannon and Pauline Stacy Fugate; three brothers, Billy Wayne, James and Estill Fugate and a brother-in-law, Ed Bailey. Survivors include her son, Dennis Weaver; six sisters, Euna Hines (James), Jenetta Shearer (Paul), Susan Gabbard (Paul), Wilma Polly (Ralph), Ruth Wheeler (Ken) and Phurbia Bailey; two brothers, Wilgus Fugate (June) and Orville Fugate (Jackie); three sisters-in-law, Barbara, Helen and Mary Fugate and several cousins, nieces and nephews. Cremation was chosen with a memorial service to be held at a later date. Dixon-Atwood & Trowbridge Funeral Home of Elizabethtown is in charge of the arrangements. To plant a tree in memory of Wanda Irene Weaver, please visit our Tribute Store. "Email Address" would like to share the life celebration of Wanda Irene Weaver. Click on the "link" to go to share a favorite memory or leave a condolence message for the family.